The coastal landscape of the United Kingdom is undergoing “climate ghettoisation,” The Guardian reports. “About 1,062,000 flats and houses, 82,000 businesses, 2.5 million people and 2m acres of agricultural land, worth about £120bn in all,” are at risk from flooding and erosion brought on by global sea level rise. Some of them will be saved, and some will simply drop to the sea. The village activated itself, found money from a dazzling variety of sources, badgered its MP and councillors, and has managed to get flood protection authorised for at least the next 20 years. The banks and channels to save their houses are being dug this autumn. Happisburgh is at the other end of the spectrum. Beach Road, a yard or two of which is disappearing almost monthly, and which has lost 26 houses in the past 15 years, is at the poor end of quite a smart village. It has been without any sea defence since 1991, when the groynes and revetment below the cliff were partly smashed in a storm and the rest removed. The people at the end of Beach Road have implored the authorities to spend the money to defend their houses, but Defra maintains that the cost-benefit ratio is too high: perhaps £2m for 18 rather poor houses. Exceptions can't be made. Campaigns have been waged, but there has been no movement on the part of the government. 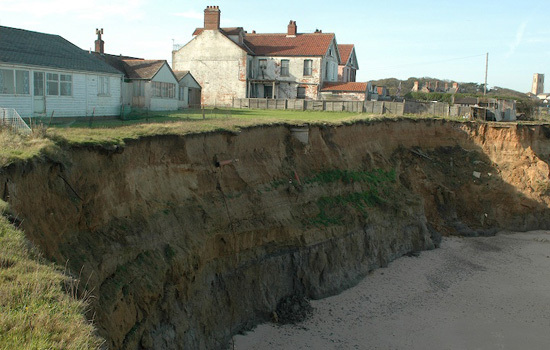 One wonders if the term “climate ghetto” can also be ascribed to Kilnsea, or at least when it is walled-in completely by its own fortification, when its neighboring villages up and down the coast have eroded away so long ago and is now an island surrounded by concretized channels, levees, revetments, sea walls, and groynes. If so, we could have two types of climate ghettos: one receding inland, forming ocean-filled valleys, and one jutting out to meet the coming sea, peninsular — in other words, the English fjords. 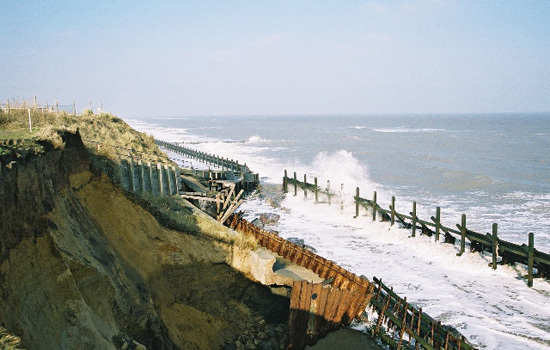 Where was it I read an accout of gov't plans to let Norfolk sea defences decay, so that the fens could become as it was for most of known history? I think it might have been over at Anne Galloway's. Or not. The British shoreline is due for some attention, regardless, as it is under duress from absentee holiday-makers, erosion, and declining rural livelihoods. At some point, some combination of effects will effect a resurgence of interest. But why? and when? Hello thankyou for your interesting article. 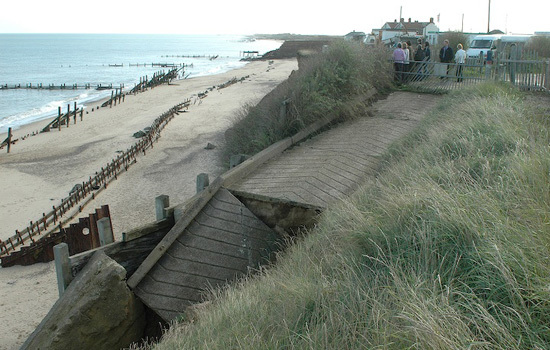 I was at school in Norwich in the 1950s and remember being taught about the natural erosion of Norfolk shorline Happisburgh (Hasebro)being mentioned by the teacher and the groynes that were constructed on other Norfolk beaches in those days. The Happisbugh article was a big item yesterday on NZ TV peak time National News. The NZ Government are strongly in support of all manner of charges to be implemented in the name of G.W.-- Biofuel, carbon tax, emission levels the list is to be endless. I am sure that you have it right, G.W.is a concept that can be used for vast gains by those with wealth and political influence. Gosh and now another large piece of ice has broken loose. PS. Only pull the chain once. Success: I found this post via the "On the coast" post. I imagined a different scenario from your title, more along the lines of a lack of a natural amenity creating a situation of climate injustice. For example, the uneven distribution of public shade trees. Some neighborhoods experience more moderate temperatures, cleaner air, and less stormwater runoff while others do not.